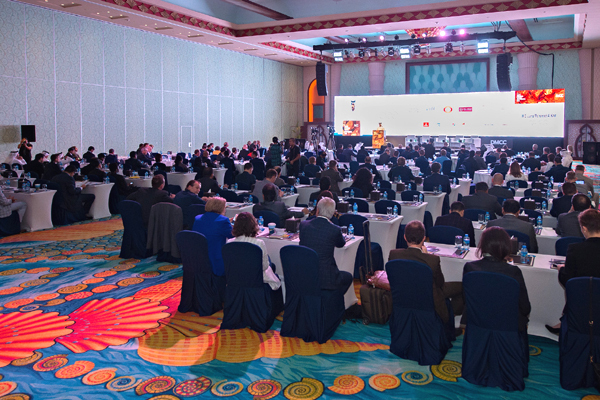 Around 300 industry experts discussed many of the key factors and opportunities shaping the global precious metals market at the recently concluded Dubai Precious Metals Conference (DPMC), which was held in Dubai, UAE. DMCC, a leading free zone for commodities trade and enterprise, held the eighth edition of its annual industry-leading DPMC with the endorsement of the UAE Ministry of Economy. Held under the theme ‘Unlocking Growth in Global Precious Metals’, the conference was inaugurated by Gautam Sashittal, chief executive officer, DMCC. “This is why DPMC is so important – its themes are synced with the priorities of the industry. Ultimately, the event is the platform to discover how, collectively, we can move forward, advance the industry and grow the precious metals sector as a whole,” he added. The keynote speech was delivered by Juma Mohamed Al Kait, assistant undersecretary, UAE Ministry of Economy. “The UAE accounts for about 14 per cent of the world's gold trade, and Dubai in particular is rising through the ranks as a purchase and investment destination as it accounts for 20 per cent of world sales of precious metals,” he said. “DMCC plays a very crucial role as a leading hub for commodities and for putting the UAE on the world map as the leader in precious metal trading. DMCC’s commitment to creating a diverse and robust trading environment aligns with the UAE’s mission to be a diversified economy and promote economic growth and development,” he added. First on the agenda was a discussion around ‘Mining and the Return of Hedging’, during which experts discussed and gauged the current mindset of mines in terms of whether or not to hedge in the wake of rising nominal dollar interest rates. Moderating the session, Jeffrey Rhodes, founder and managing consultant, Rhodes Precious Metals Consultancy DMCC. “Gold, ultimately, is the perfect medium if you are in emerging market territory and today the market is wide open to everybody and not just central banks or institutional investors,” he added. The following session focused on ‘Central Banks Approach to Gold’, during which experts offered their insights on the impact of factors such as currencies and trade tensions on their decision-making processes. “Although new payment instruments and corresponding currencies are appearing, we see how unstable cryptocurrencies and other new currencies are. Therefore, gold will always be a solid long-term investment and keep its stable position,” he added. “But the industry is focused on retaining gold as the first choice in the luxury spend. To do that, we all have to collaborate in order to evolve and to grow our businesses – success will stem from a collective effort,” he added. “People forget about the compounding effect on price rises. It was not so long ago, the price was $254, we never thought we would be at $1,300,” he added. Delegates in attendance received a copy of the flagship ‘World Silver Survey 2019’ report, from The Silver Institute, which was also launched during the conference, with a simultaneous New York release. Published annually since 1990, the report details supply and demand statistics for key sectors of the silver market, as well price and trade data.